Step 1 Heat the oven to 375 degrees. Butter a 9-by-13-inch gratin dish. Step 2 Combine the apricots, raspberries, honey, 1/3 cup sugar and orange juice in a bowl and toss lightly to mix. Taste an apricot and add more sugar if it’s not sweet enough. Add the cornstarch and stir to mix well. Step 3Pulse the flour, light brown sugar and salt in a food processor long enough to break up any clumps of brown sugar. Scatter the cubed butter over the top and pulse just enough to make a crumb mixture. Tip the crumbs into a bowl, scatter the sliced almonds on top and toss to mix. Step 4Tip the apricot mixture into the gratin dish and level with the back of a spoon. Step 5Gather handfuls of the crisp mixture and press them into rough balls (they won’t hold together very well). Break off chunks about the size of a hazelnut, and scatter them evenly over the top of the fruit, being careful not to press them into the fruit. Step 6Bake the crisp until the topping is golden brown and the filling is bubbling around the edges, 40 to 45 minutes. Remove to a rack to cool a bit before serving. In Recipes-list.com we have selected the most viewed recipes from category - Desserts . Enjoy the best recipes specially selected for you! 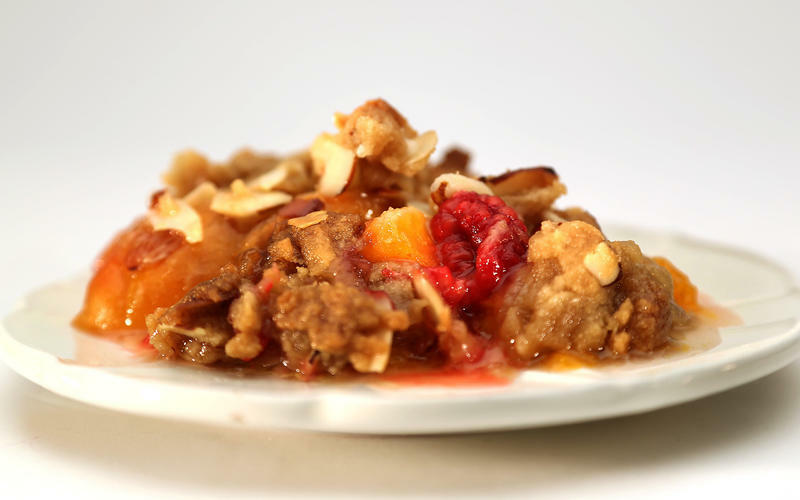 Apricot-raspberry crisp with almonds is the right choice that will satisfy all your claims.